A line of 10 mt pneumatic boats with great performances and comfort. 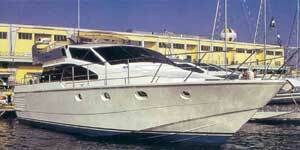 Marchi 50’ (50ft) a motoryacht which distinguishes itself for its strenght and comfort. This fly with its classic profile is a diamond in the Marchi’s production. Measures mt 15,80 x 4,80 and is a boat that can face every kind of navigation on the high sea. 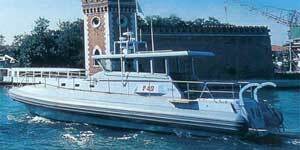 With this boat model Mr Ezio Marchi took part at the Venice-Montecarlo and he arrived first of class. Great gifts of navigability, of solidity and resistance for this yacht. 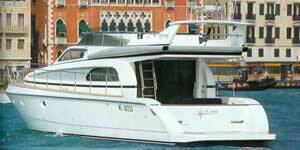 Marchi 52’ (52ft) Super Alfa Cabin. Super cruise tender. The last born in the navigation on the high sea boats' line with tubolar bell, it has obtained the A Oceanic class. Although its technical characteristics of tough navigation , the interiors of this yacht are particularly sumptuous like a luxury motor yacht. Measures mt 16,50 x 5,00 and is supply with 3 cabins and 2 bathrooms with a very spacious binnacle. Marchi 52’ (ft) Super Alfa Fly. A boat of futuristic technologies. An excellent boat for the external navigation in total security. Measures mt 16,50 x 5,00 and is fair to call it boat even if technically is a rigid keel tender. Marchi 53’ (53ft) a motoryacht with a gentle profile which presents itself as a natural evolution of the traditional 50’ boat. Measures mt 17,05x4,75 and goes classified between the important boats, of image. Marchi 72’ (72ft) Wide Body - a new yacht of more than 22 mt in fibreglass. Innovative solutions for the new boat of 22 mt by Marchi; a motoryacht wich distinguishes for the width of the spaces under and upper deck. Fratelli Marchi Boatyards - Nautical constructions - Italian boat building (boatbuilder) - customizable boats and yachts with personal choice of materials, layout, engines selection. Pleasure boat building, classic boat refitting, carrying out project and one-off boat, building of technology boat for any marine corporation, costumer service in all over the world, beaching/launching - antifouling and anti-osmosis treatment, winter shelter, dock/ marina near Venice - Italy.